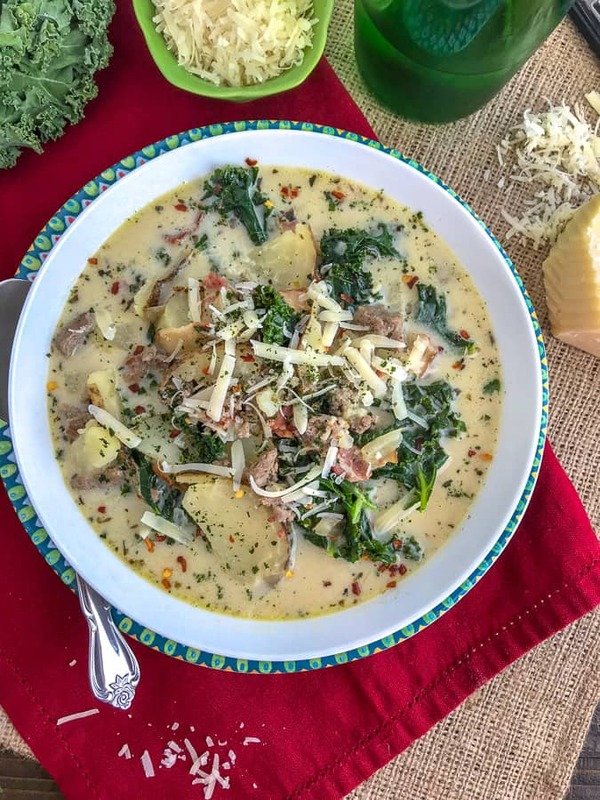 This Healthy Zuppa Toscana is packed full of tender russet potato slices, fresh kale, bacon, and turkey sausage seasoned with Italian flavors. 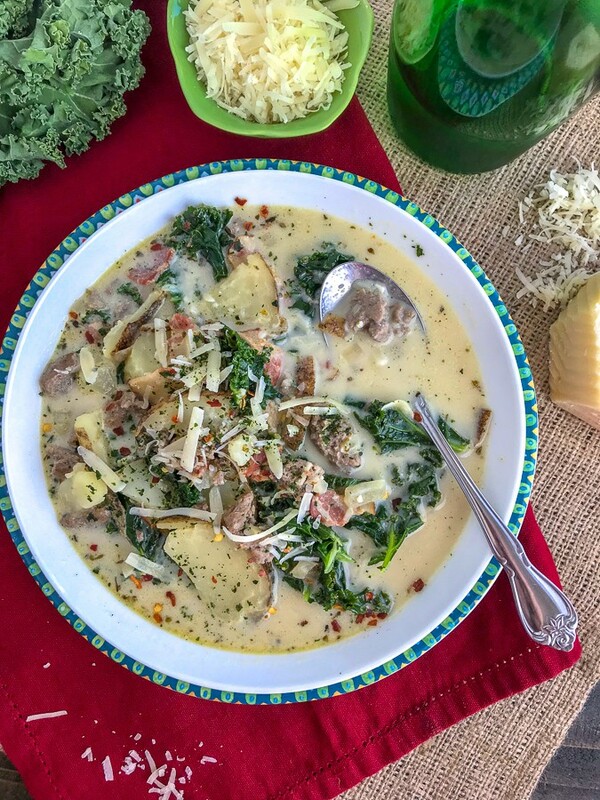 All in a rich, creamy broth that tastes just like the Olive Garden – but lightened up! This soup is sugar free, grain free and gluten free. It comes together in one pot in 30-35 minutes! Fun fact about me: One of my first jobs in my teens and into my early twenties was at the Olive Garden back home! I worked as a hostess, a To Go specialist, and bussed tables. It wasn’t an easy job, but it was certainly a delicious one. HA! 🙂 If you follow me on Instagram, you know that I am a pasta and bread lover, as well as soup fiend. 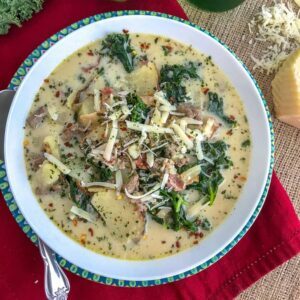 So it should come as no surprise that I have another delicious, flavorful and easy soup recipe for you! This one comes together in one pot and tastes just like Olive Gardens! But it’s made on a healthier, lighter note – without sacrificing flavor. It’s all about how you season it! My husband and I hardly eat out except for the occasional date night, so it is imperative to make the things we enjoy most at home. Heat olive oil in a large soup pot over medium-high heat. Add the turkey sausage and break it apart into tiny pieces as it cooks. Season with Italian seasoning. Cook through. Remove to a plate and set aside. Add the diced bacon, stir and cook for 7-8 minutes, or until the bacon is cooked through. Transfer to the same plate as the turkey sausage and drain all but a tablespoon of bacon grease from the pot. Sauté onions in the pot until they become translucent. Add minced garlic and sauté for 30 seconds, stirring. Pour in the chicken stock and water. Season with oregano, basil, and thyme. Add salt and pepper, to taste. Increase the temperature and bring to a boil. Add the potatoes and boil for 6-8 minutes, or until they are fork tender. Reduce the heat to medium. 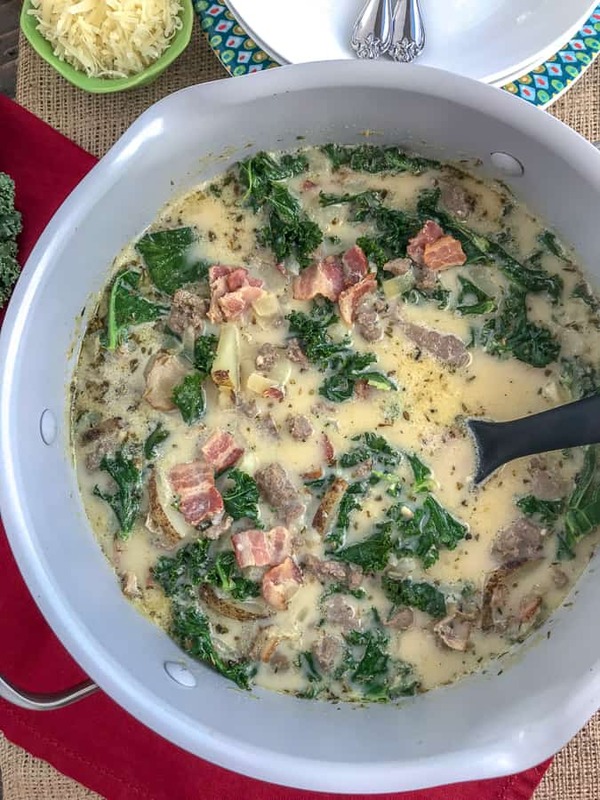 Stir in the half and half, cooked sausage, bacon, and kale. Allow to cook 2-3 minutes. The kale leaves will soften slightly. You don’t want to overcook them. And if you’re a major fan of bread bowls, then you will love my Homemade Italian Bread Bowls! They are so easy to make, only require a few ingredients and are ready in an hour. Crispy on the outside, while being soft and fluffy on the inside. Just like a bread bowl should be! 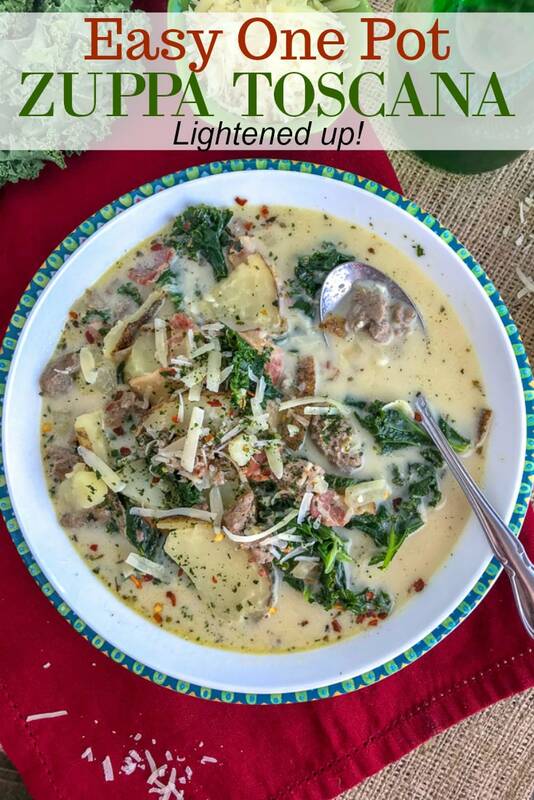 Learn how to make Olive Garden's popular Zuppa Toscana at home and on a lighter note! Everything comes together easily in one pot and is guaranteed to wow you and your family. 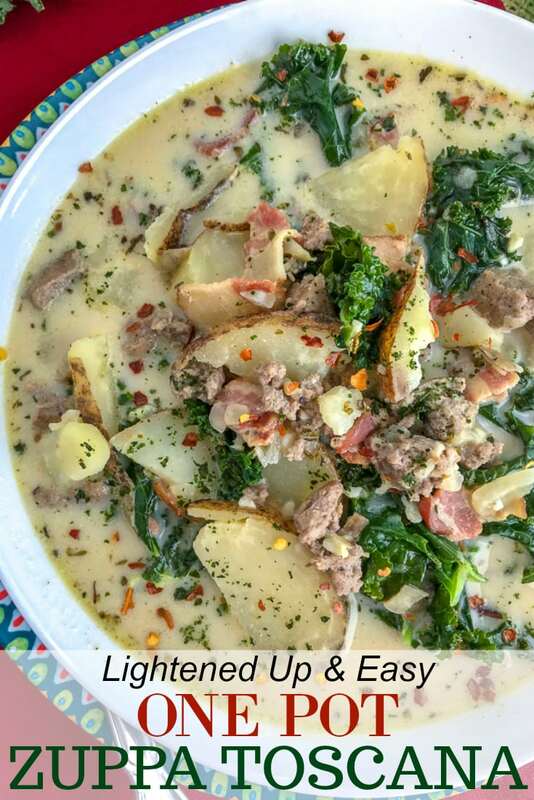 Tender russet potatoes, kale, bacon, and turkey sausage - all seasoned to perfection! Place a large soup pot with olive oil over medium-high heat. Once heated, add the turkey sausage and break it into small chunks as it cooks. Season with Italian seasoning and continue to cook through. Transfer to a plate and set aside. Add the bacon, stir and cook 5-6 minutes, or until cooked through. Transfer to the same plate as the sausage and drain all but 1 tablespoon of bacon grease from the pot. Place the pot back on the stove, add the onions and allow to sauté 3-4 minutes or until translucent. Add garlic and sauté for 30 seconds, stirring. Pour in the chicken stock and water and bring to a boil over high heat. Add the potatoes and boil until fork tender, approximately 10-12 minutes. Time will be dependent on how thickly cut your potatoes are. 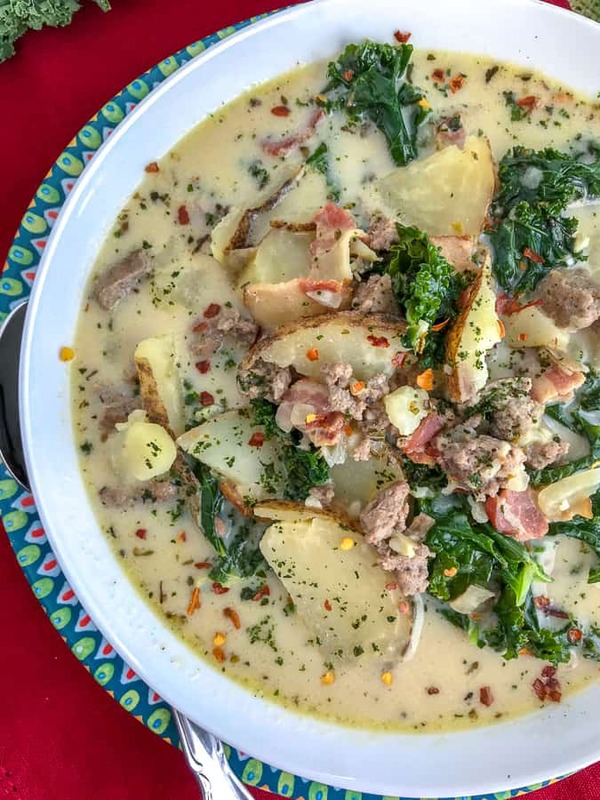 Reduce the heat to medium and pour in the half and half, add the sausage and bacon back to the pot, as well as the chopped kale. Cook until the kale is a bright green and has softened. Season with salt and pepper, to taste, if desired. Serve garnished with red pepper flakes, freshly chopped basil, and grated parmesan cheese. BROTH/STOCK: I prefer stock in this soup (as well as many), as it provides more flavor, but you can use broth instead. Vegetable or chicken will work. - If using regular broth or stock (that is not 'unsalted' or 'low-sodium'), I would recommend adding additional salt with discretion. Season to your taste preference.